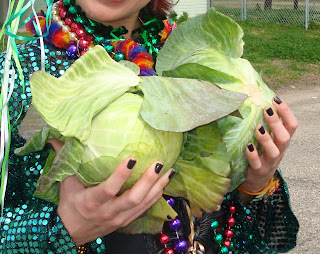 Sumer and I caught so much cabbage at the Irish Italian Parade in Chalmette, but I had never cooked cabbage before. So I went on a search to find some good recipes. Plain coleslaws led to Asian coleslaws but I wanted something sauteed. So this is what I created. It's so good. I am so excited to find another vegetable recipe to bring for lunch because I need more fruits and veggies in my life. (I am such a nerd) Plus, cabbage is cheap! In a medium bowl, whisk together the rice vinegar, oil, vinaigrette, peanut butter, soy sauce, brown sugar, ginger, and garlic. 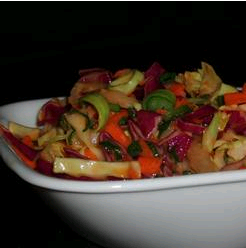 In a large bowl, mix the green cabbage, red cabbage, red bell peppers, carrots, green onions, and cilantro. Toss with the peanut butter mixture. In a sauce pan or wok, saute mixture over medium-high heat for 2 minutes then add water, curry powder, and red pepper. Continue to saute until vegatables reach desired tenderness. Top each serving with peanuts. Please try this recipe out and let me know what you think. I hope it adds a healthy staple to your weekly meals! Wow! I am definitely going to try this! i actually eat quite a bit of cabbage, but nothing ever this complicated. a head of cabbage, some beef stock, salt and pepper, and maaaayyyyybe some lean sausage or bacon is a staple for me. lesli and i also discovered something called haluski on food network and i've made that a time or two. that recipe is pretty much the opposite of healthy though. i'll have to give your recipe a whirl sometime. glad that ya'll are going to try it! i don't make things that are complicated. i had everything in the house already except for the Splenda, some veggies and fresh herbs. Please Please make this for me! My birthday is coming up! Sure! But you have to tell me who you are, Anonymous!